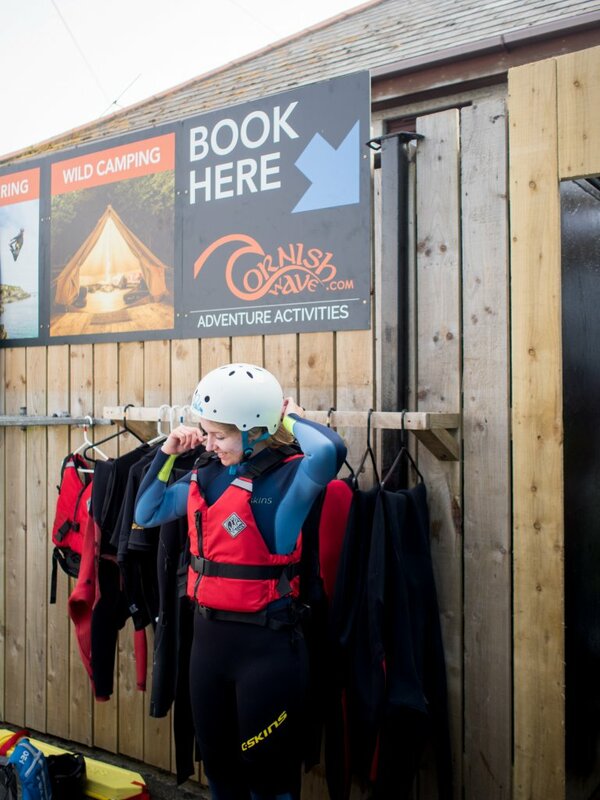 Surfing, Camping & Coasteering on Cornish Wave’s Adventure Weekend! 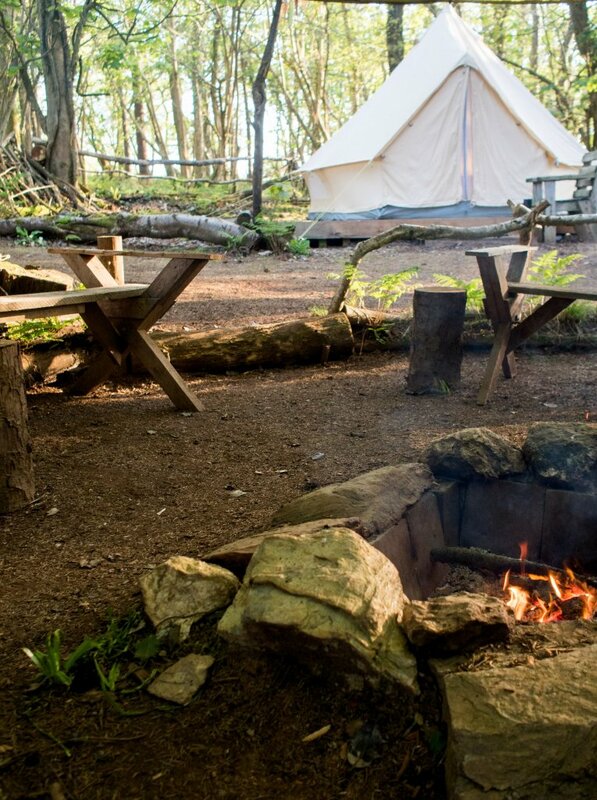 Spending the weekend outdoors, in the ocean and camping in the forest is pretty much a dream come true! I couldn’t believe how lucky we were when the early May bank holiday rolled around with beautiful sunshine, just in time for our outdoor Adventure Weekend with Cornish Wave. 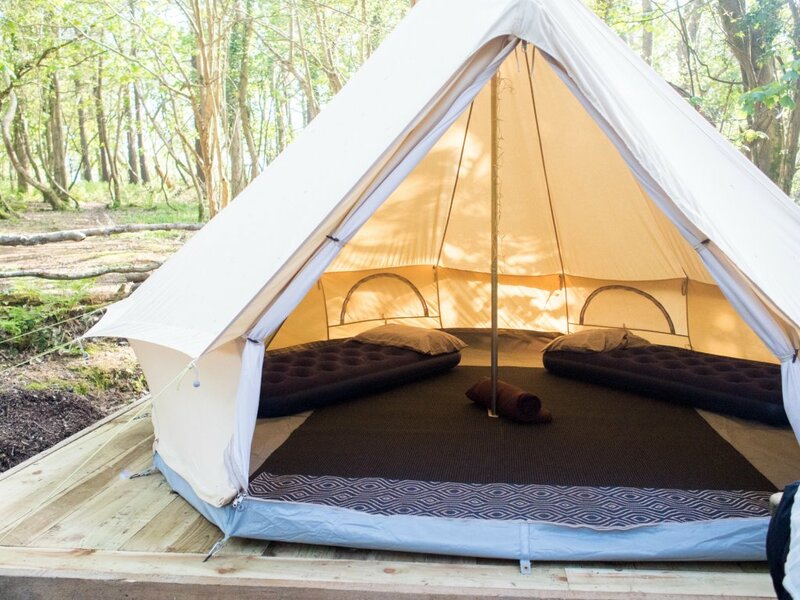 This company, based in Newquay, offer surf lessons, coasteering days and wild camping weekends at their very own hand-built campsite. 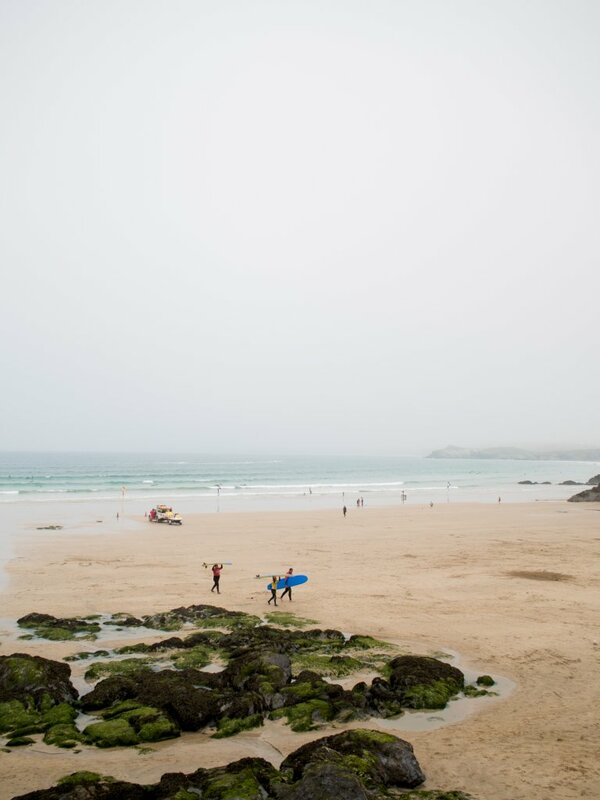 Funnily enough, everywhere in Cornwall seemed to be in beautiful warm sunshine EXCEPT Newquay on the Saturday, when we were booked in for our surf lessons with Jey. It didn’t deter us though, so after our briefing with him and our little group of adventure enthusiasts, we headed into the water! The Adventure Weekend includes two 2-hour surf lessons (ours were Saturday morning and Saturday afternoon – and yes, four hours of was intense but super fun! 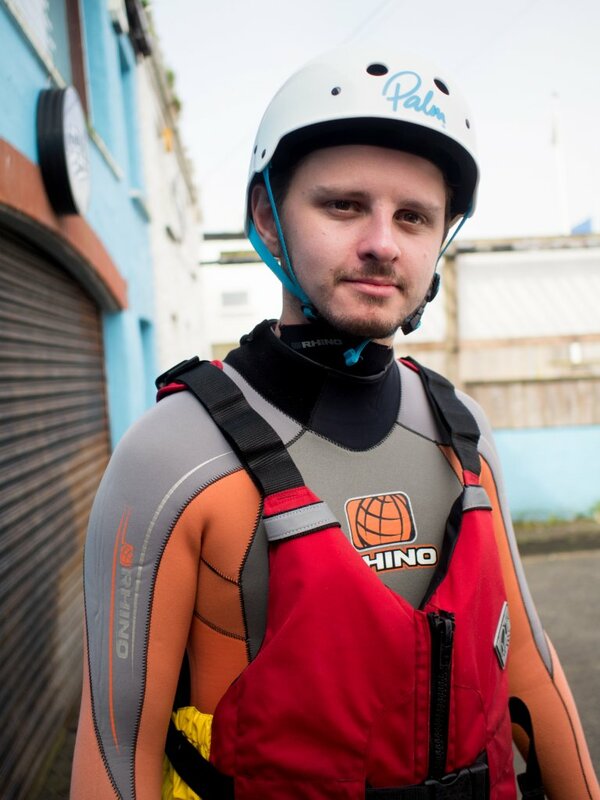 ), a coasteering session (usually around 3 hours) and an overnight stay at the wild campsite. Jey was an excellent surf instructor, and in fact I think one of the best I’ve had! He was super friendly and relaxed, and took time to explain to us newbies about the different surf conditions, types of waves, and pretty much anything we had questions about. After our exhausting day in the water, we all popped into Sainsburys as a group to pick up some camping/BBQ food and followed Jey in convoy to the secret camping spot – where luckily, the sun was shining over for our evening! 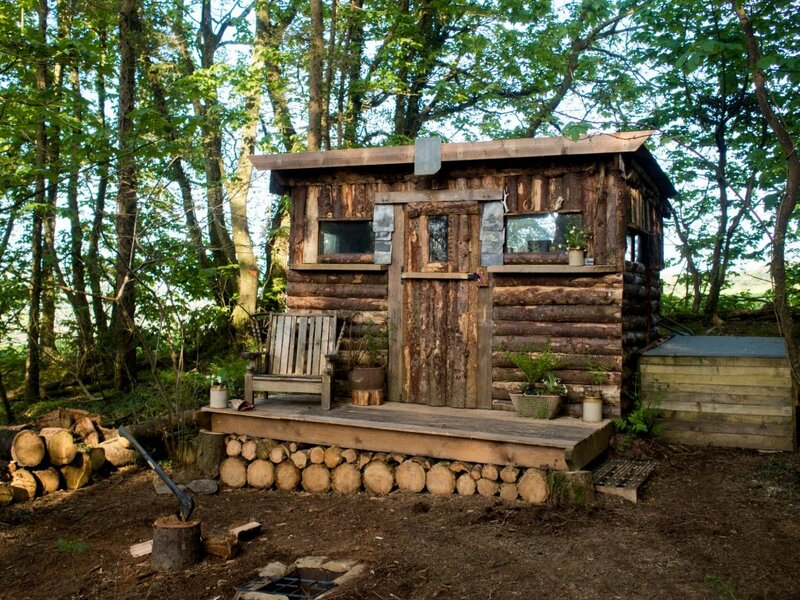 Based in a forest of a farm on the outskirts of Truro, Jey and the Cornish Wave team have spent the last couple of years clearing the woodland and building something truly magical, all by hand. 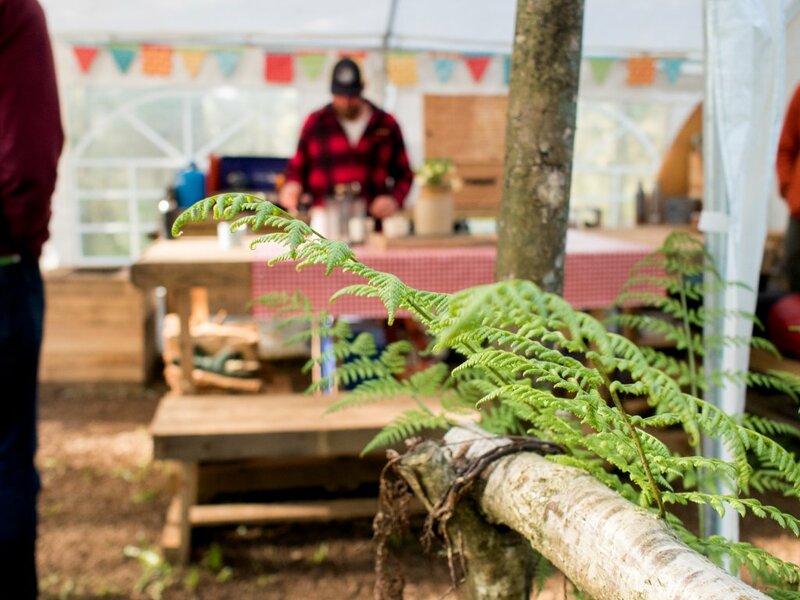 With bell tents, games area, a host cabin, kitchen, campfire area and even a compostable toilet, the wild campsite is spectacular; every little detail had been thought through and we just couldn’t get over the fact they made everything themselves. 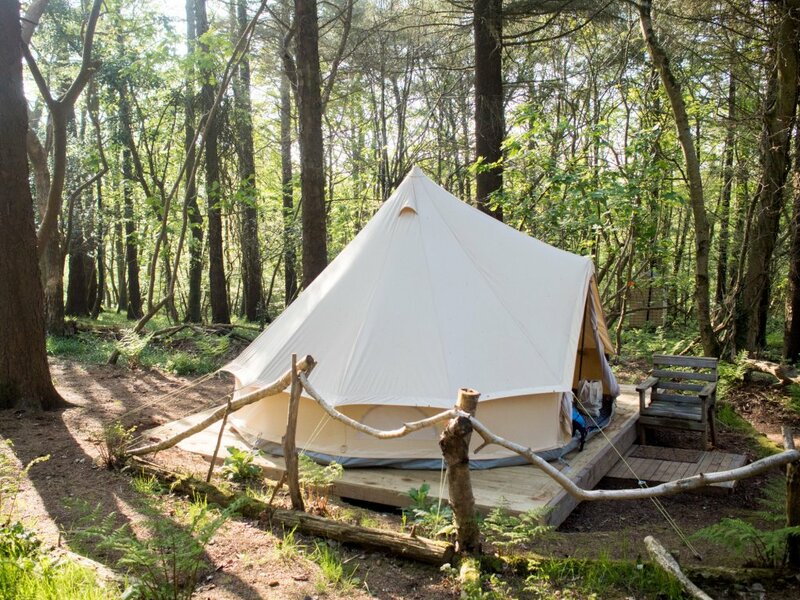 Thanks to our small group, it meant each couple got one bell tent each – but be prepared to share if you’re booked on one of these weekends, as it was unusually rare for us to do that! 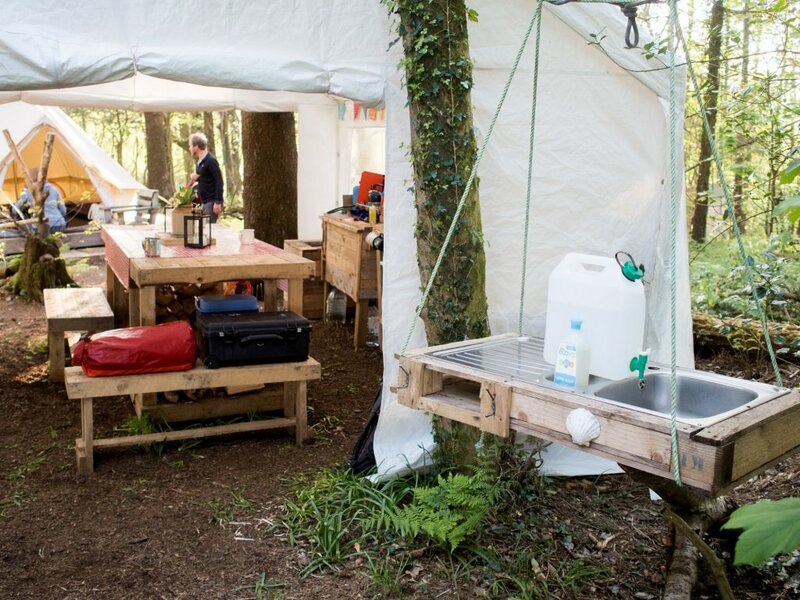 There’s a marquee kitchen (all made from old pallet boards) with all the food preparation equipment and facilities you might need to get your barbecue food ready, and Jey and his crew (Daz and Benn) were there on hand to help with everything and set up the fire and barbecue for us too. 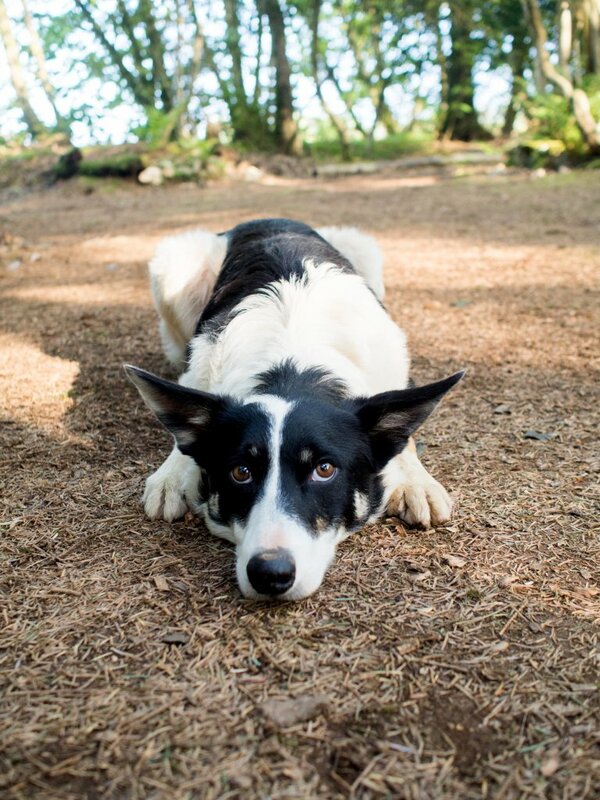 Oh and Misty the dog, too! 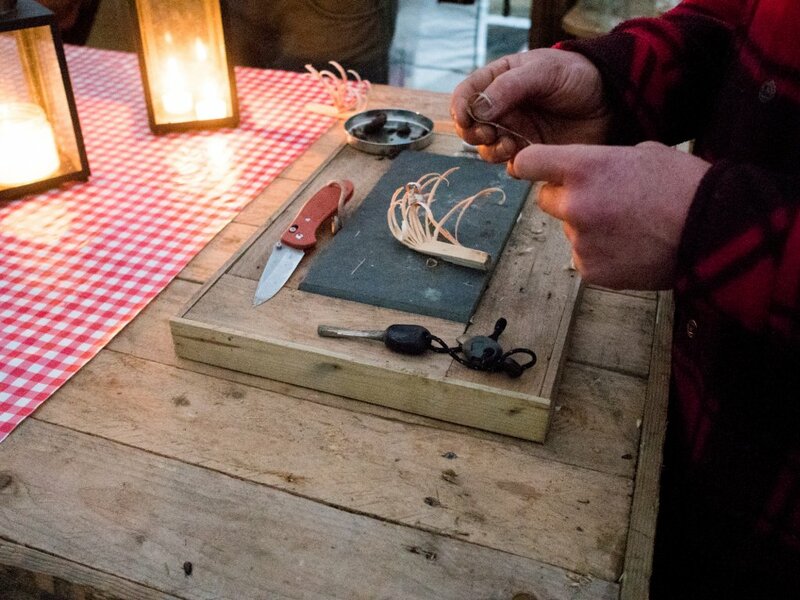 Our hosts stayed on site too, and joined in throughout the evening with drinks and great company; at the end of the night staying in a cabin down the hill – again all built by hand by them! 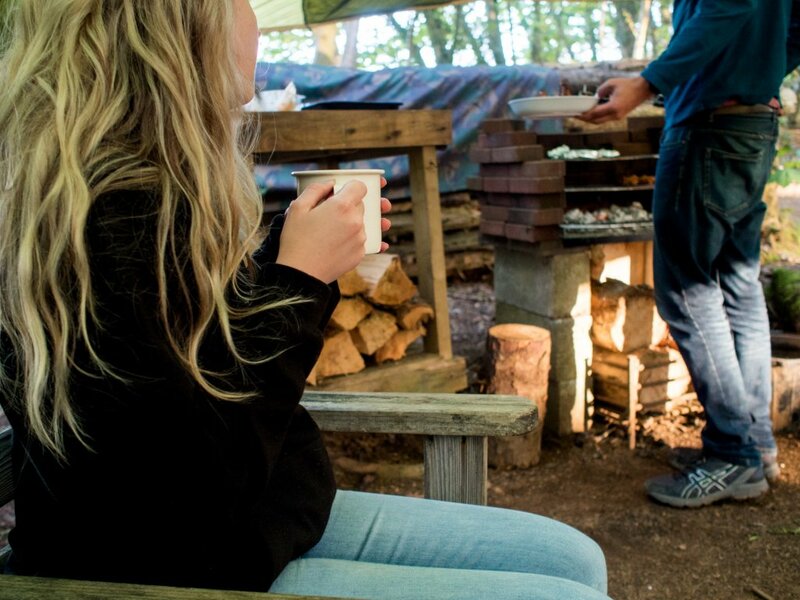 We gathered around the campfire with wine (in cups, of course!) and our food, chatting about travel adventures and making friends. But the night didn’t stop there. As it started to get dark, Daz set about teaching us how to start a fire! 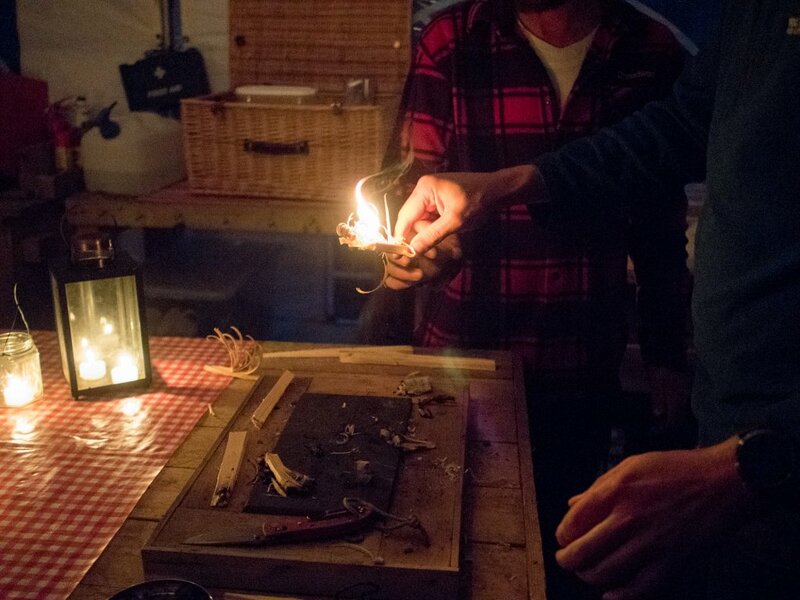 Using a flint and bits of wood found in the forest we were in, we all tried making our own firestarter too. Some were definitely better at this than others! Sleeping in the bell tents, we had loads of space to ourselves but it was still warm and cosy (Alex and I brought a sleeping bag AND two duvets… very luxurious). It was amazing waking up to natural light coming through the canvas and the sound of birds and nature. After breakfast, we packed up our things, said goodbye, and headed back to Newquay with Jey for our morning coasteering adventure! Neither Alex nor I have ever done coasteering before, plus it was a beautiful sunny day, so we were excited to get in the water! (FYI, the definition of coasteering, if you don’t know, is roughly ‘entering and exiting the water in a controlled way’!). That means, climbing in and out of the sea from rocks, and (EEK!) jumping off high cliffs into deep water for an adrenaline rush! It was scary at first, but so much fun, and of course Jey made us feel safe by talking us through everything first, and no one was pressured to do any jumps they didn’t want to do. It just felt amazing to be in the water on such a hot, sunny day in May! 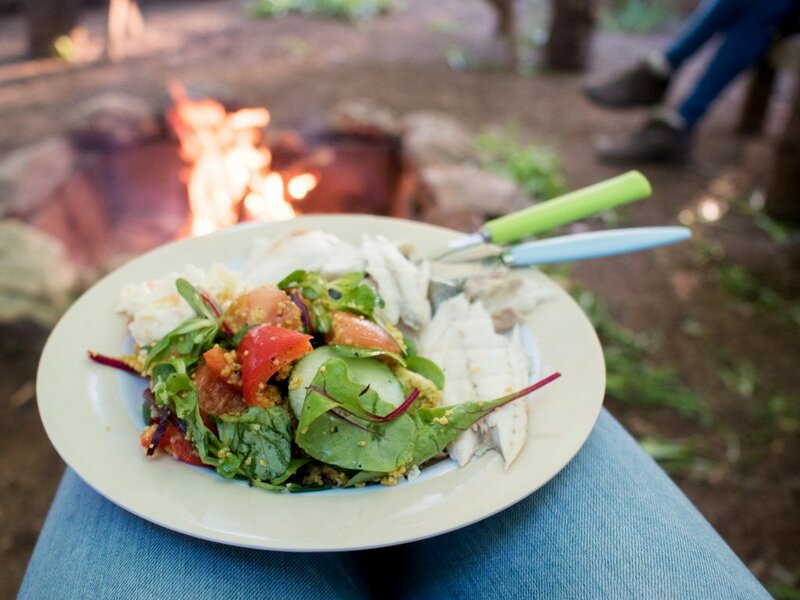 I loved every element of our weekend and would totally do it all over again! 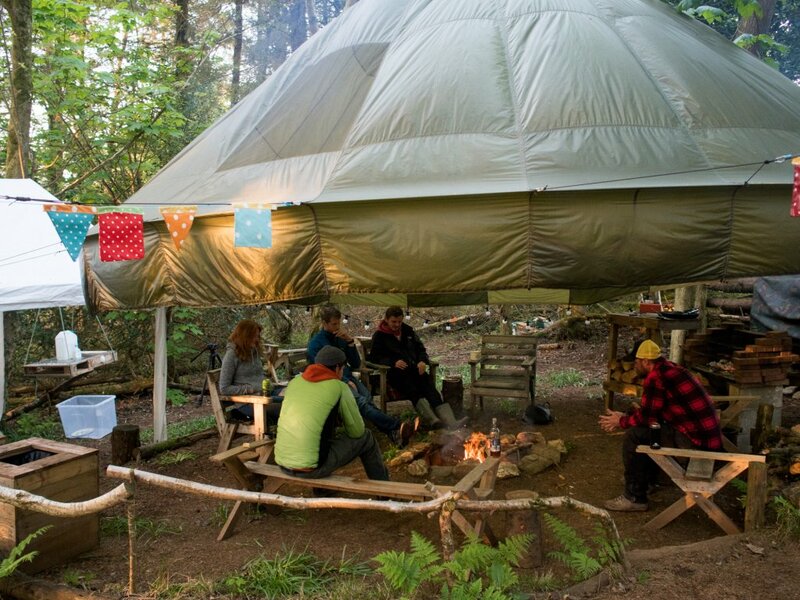 I think this would be amazing fun in a big group of people for a birthday or something like that as well – Cornish Wave often take on Stag & Hen weekends too. Highly recommended! Go check out the Cornish Wave website to see all their activities and weekends! 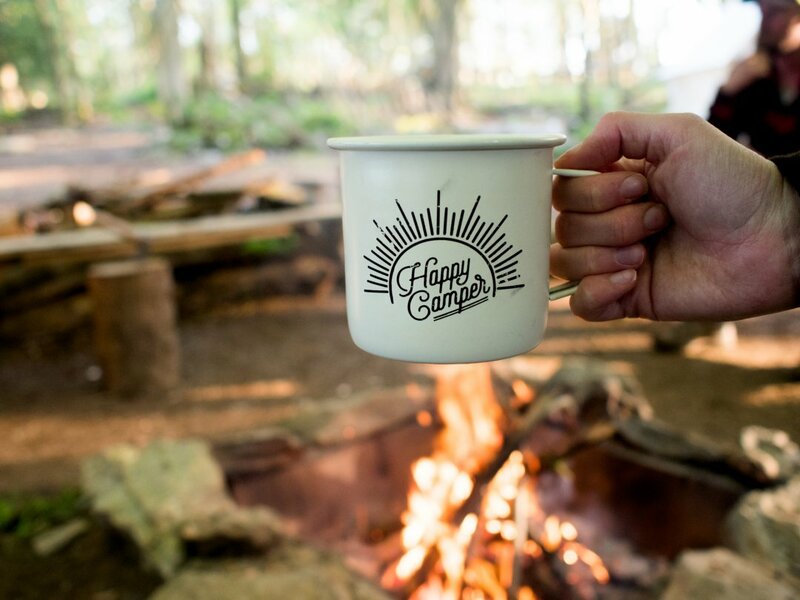 * Cornish Wave kindly offered me a complimentary space on their adventure weekend, but all thoughts are my own – I had a great time!